Robert A. Heinlein Born Robert Anson Heinlein in Butler, Missouri, on July 7, 1907, the third child of Rex Ivar Heinlein, an accountant, and Bam Lyle Heinlein. Moved to Kansas City as an infant; attended Central High School and Kansas City Junior College. In 1925 entered the United States Naval Academy in Annapolis, Maryland. Served as a midshipman on the U.S.S. Lexington (1929–32) and on the U.S.S. Roper, later promoted to lieutenant, but was forced to retire in 1934 after contracting tuberculosis. Married Leslyn MacDonald in 1932 (his first marriage, to Elinor Curry in 1929, ending quickly in divorce). Moved to Los Angeles in 1934 and became involved in Upton Sinclair’s End Poverty in California movement; ran unsuccessfully for California State Assembly as an EPIC candidate in 1938. 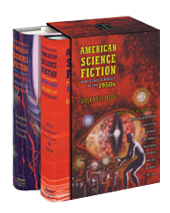 Published his first story, “Life-Line,” in Astounding Science Fiction in 1939 (also completed a novel, For Us, the Living, published posthumously in 2003). Joined the Los Angeles Science Fiction League, and began hosting gatherings of the Mañana Literary Society—an informal group of science fiction writers including Leigh Brackett, Ray Bradbury, L. Sprague de Camp, Henry Kuttner, and C. L. Moore. Traveled to New York in 1940, meeting John W. Campbell Jr., L. Ron Hubbard, and others, and in 1941—already established as a leading writer for Astounding—was guest of honor at World Science Fiction Convention in Denver. Volunteered for active duty after Pearl Harbor but was turned down; worked as a civil service engineer in the Aeronautical Materials Lab at the Philadelphia Navy Yard (1942–45), recruiting Isaac Asimov and others as coworkers. Returned to Los Angeles and to writing after the war, selling stories to The Saturday Evening Post and beginning a series of juvenile novels for Scribner’s with Rocket Ship Galileo (1947), followed by Space Cadet (1948), Red Planet (1949), and others. Moved to Colorado Springs, Colorado, in 1948, after a divorce; married engineer Virginia Gerstenfeld. (Their jointly designed ultramodern house was featured in Popular Mechanics in 1952.) Began work with Alford Van Ronkel on screenplay for Destination Moon (loosely based on Rocket Ship Galileo), filmed in 1949–50. Reworked earlier magazine serials into such novels as Beyond This Horizon (1948) and Sixth Column (1949), and wrote new novels The Puppet Masters (1951), Double Star (1956), The Door into Summer (1957), and Starship Troopers (1959), initially rejected as a juvenile because of its violence. Concentrated exclusively on novels after 1959. Gained cult following beyond the science fiction community with Stranger in a Strange Land (1961). Final juvenile Podkayne of Mars (1963) was followed by Glory Road (1963), Farnham’s Freehold (1964), and The Moon Is a Harsh Mistress (1966). Moved to Santa Cruz, California, in 1966. Later novels included I Will Fear No Evil (1970), Time Enough for Love (1973), The Number of the Beast (1980), Friday (1982), Job: A Comedy of Justice (1984), The Cat Who Walks Through Walls: A Comedy of Manners (1985), and To Sail Beyond the Sunset (1987). Moved for last time to Carmel, California, in 1987; died there on May 8, 1988, of emphysema and congestive heart failure. Was posthumously inducted into the Science Fiction Hall of Fame in 1998. 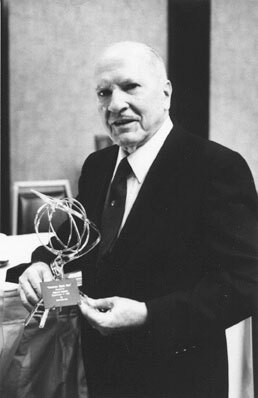 Five of Heinlein's science fiction stories were adapted for the NBC radio series Dimension X in 1950–51. "Destination Moon"—adapted from the 1950 Destination Moon screenplay, on which Heinlein collaborated—aired on June 24, 1950. "The Roads Must Roll"—published in Astounding Science Fiction, June 1940—aired on September 1, 1950. "Universe" (Astounding Science Fiction, May 1941) aired on November 25, 1950. "The Green Hills of Earth" (Saturday Evening Post, February 8, 1947) aired on December 24, 1950. "Requiem" (Astounding Science Fiction, January 1940) aired on September 22, 1951.